Nobel laureate Prof. Torsten Nils Wiesel delivered a public lecture, dubbed “Science for Peace,” at the DLSU’s Teresa Yuchengco Auditorium. Prof. Wiesel, 1981 Nobel Prize winner for medicine, talked about how science plays a role in fostering world peace throughout the course of history, especially during the 1900s, all the way to the present. Wiesel also discussed the contributions of his fellow scientists, who became Nobel Peace Prize winners themselves, like Linus Carl Pauling, Andrei Sakharov, Mohamed El Baradei, among others, for world peace. After the discussion, an open forum was held as the attendees asked burning questions for Prof. Wiesel. The lecture, which is part of the BRIDGES – Dialogues Towards a Culture of Peace series, facilitated by International Peace Foundation, was attended by leaders of educational institutions, science schools and other groups whose advocacies are connected with the sciences and Lasallian leaders. Br. Bernard S. Oca FSC, DLSU Vice Chancellor for Lasallian Mission and External Relations, served as the Master of Ceremonies for this two-hour event. 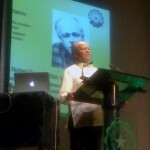 Also present during this lecture were Brother Presidents/Chancellors of different Lasallian schools in the Philippines. Among them were Br. Manuel Pajarillo FSC of De La Salle Lipa, Br. Kenneth Martinez FSC of De La Salle Canlubang, Br. Victor Franco FSC of College of St. Benilde and Br. Armin Luistro FSC of De La Salle University. Br. Armin also delivered the welcome address for this lecture. Mr. Francis Estrada, DLSU Chairman of the Board of Trustees, read the Authority of the Board of Trustees and Mr. Uwe Morawetz, International Peace Foundation Chairman of the Board of Directors introduced the BRIDGES Program.